Home > Learning Disabilities > What is Opposition Defiance Disorder? Tantrums and difficult behaviour in children is not uncommon, especially during early developmental years – the ‘Terrible Twos’ – and later during teenage years. Disciplinary boundaries are tested, stubbornness and defiance can prevail in certain situations as the child grows and develops physically, emotionally and mentally. But in a small number of cases, chronic or repeatedly defiant, negative or hostile behaviour can indicate a disorder. There are two conditions that may be at the root of such behaviour, and may be seen in up to 50 per cent of children with ADD (Attention Deficit Disorder). Both conditions primarily affect boys, but not much is known about their actual cause. The first is known as ODD – Oppositional Defiant Disorder, and the second is Conduct Disorder (CD). Both are considered behavioural or psychiatric disorders, but the two conditions are treated separately from ADD, as ADD is not regarded as the cause of both of these conditions. Of the two disorders, ODD is the most common and least severe condition. The symptoms and behaviours associated with ODD may present from an earlier age than CD, usually in children younger than nine or ten. For many children affected by the disorder, the signs become apparent around four or five, when they start school. Typically, ODD behaviour is persisting negative, provocative, argumentative, defiant or disobedient. A child with ODD is not particularly violent or aggressive, but continually displays these behaviours, sometimes long after friends, siblings or playmates have overcome them. Untreated, the condition therefore may have a lasting effect on ability to learn, form friendships, and emotional wellbeing. 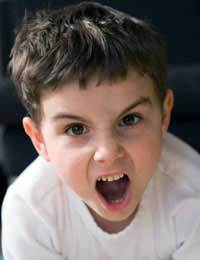 It may be difficult to diagnose ODD in younger children particularly, as many children go through phases of displaying disobedient or defiant behaviour. This is why professional evaluations must be carried out, especially since the behaviours associated with ODD may also present as symptoms of other emotions, conditions or disorders such as anxiety, mood swings, depression, ADD and a range of other learning disabilities. Many of the behaviours exhibited by a child with ODD can become heightened at school or at home. Ongoing patterns of negative, defiant, un-cooperative, belligerent, hostile behaviour for at least six months. Four or more of the following behaviours are often present during these six months: vindictive or spiteful behaviour, easily aggravated, easily angered and loss of temper, defiance of authoritative figures such as parents or teachers, deliberate provocative behaviour that causes annoyance to others. The behaviour has a significant (clinical) impairment in school life, social life or occupational functioning. The behaviour does not satisfy the criteria for Conduct Disorder (CD) or antisocial personality disorder. The behaviour is ongoing and does not just occur during a mood disorder or psychotic disorder. Although not much is known about the root causes of ODD, there are several modes of specialised treatment that can be undertaken once an accurate diagnosis has been made. The kind of treatment that a child with ODD receives should be tailored according to their exact needs and the nature of the problem. It may also be affected by the presence of other conditions or disorders, such as bipolar or ADD. Psychotherapy and non-stimulant medications are two options that can be carried out. Depending on the presence of other conditions such as ADD (the element of behaviour which responds to certain stimulants), stimulant medication such as Ritalin may be used, but this is subject to diagnosis and review. This is also the case for the inclusion of a special diet that may help to treat the symptoms of ODD. With psychological therapy, parents or the entire family can be involved in the treatment process, improving communication, anger management and the handling of ODD symptoms by parents and siblings in the home environment. Family therapy can help the whole family to encourage positive behaviours and constructively manage the stressful confrontation behaviour often displayed by those with ODD. In some cases, cognitive therapy is thought to be extremely beneficial as it aids problem solving techniques and social interactions between family members, peers, and authority figures.